We feature one of the largest selections of wine, whiskey, beers and microbrews in the Wichita area. We take pride in being a boutique wine store with one of the best selections in Wichita. If you can’t find it here, we will order it for you if it is available. Introducing Wichita's first temperature controlled Wine Cave.All Higher end wines in the wine cave are laid down on mahogany wood wine racks and kept at a strict 55 degree. (The same temperature as the wine makers in France store their wines underground). Tuesdays are Wine Days with in-store tasting from 5pm to 7pm AND 20% off all wines in stock. Rolling Hills celebrates every Wednesday with 10% off all micro brews and import beers. 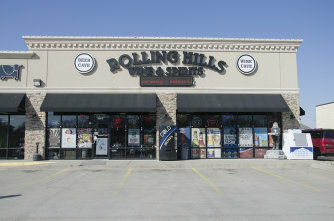 Rolling Hills has one of the largest Beer Caves in town holding 12, 18, 24 and 30 packs at a constant 33 degrees. Shopping for beer is always cool in our Beer Cave. We have always had one of the top selections of micro beers in Wichita with new beers coming in every week. Come in and mix your own six pack (Mix A Six) of micro beers, like our Micro single door, or try the Bomber Micro door. Buy 3 Bombers to get 10% off anytime. We have one of the best selections of special and hard to find single barrel and single Malt whiskeys. If we don’t have it we will special order it in for you. 10% senior discount every day! Come on in and browse our vast selection.